South Africa’s Ashleigh Buhai reeled in three birdies on the front nine of Westlake Golf Club this morning to take a one stroke lead into the back nine at the R2-million Investec South African Women’s Open. Buhai started the day one behind the overnight leader Karolin Lampert of Germany but made the most of the tranquil conditions in Cape Town and fired birdies at the first, fifth and sixth holes. A strong birdie on the first hole saw her tie for the lead with Lampert, but the German responded with a birdie on the fourth hole. There was a two-shot swing on the fifth, which Lampert bogeyed before Buhai took a two-stroke advantage with her birdie on the sixth. Long-hitting Lampert birdied the par-5 seventh to narrow the gap but missed a great opportunity to tie for the lead when her birdie putt on the ninth from five feet moved below the hole. Buhai then birdied the 10th to regain her two-stroke advantage. 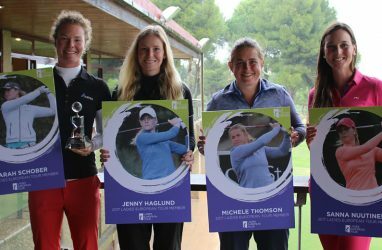 Moroccan Maha Haddioui was in third place on three-under-par after 10 holes and looking for her best finish on tour, following a tie for 14th in the 2016 Fatima Bint Mubarak Ladies Open. Finland’s Ursula Wikstrom showed what was possible with her five-under-par 67 which saw her take the clubhouse lead on one-under-par.